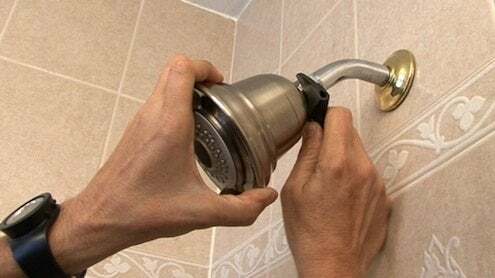 Replacing your shower head is a simple fix that can spruce up the look of your bathroom, save water, and even add a little massage action to your daily shower. For this job, you need only the new shower head, a wrench, a soft cloth, and some teflon tape. Turn off the water at the faucets, then use the wrench to take off the old shower head. Lefty-loosey: turn the wrench counter-clockwise. Depending on how long the old shower head has been in place, it could take some elbow grease to get it off. Be firm but don’t force it. And don’t throw it away until the new shower head is installed and working. Wipe off the threads to get rid of any dirt, grime, or old pieces of string or tape. Then wrap the threads with new teflon tape in a clockwise motion and screw on the new shower head. If you need to tighten it with the wrench, be sure to cover it with a soft cloth to prevent scratches, and only give it a quarter turn. Then turn on the faucet and check for drips – you’re done!